Addiction is an illness that takes hold of a person’s life and overshadows everything in it. But, like anyone else, people who suffer from addiction and substance abuse have unique skills and valuable perspectives to share with the world. All too often, addiction takes them to a place so dark those skills are left unused. 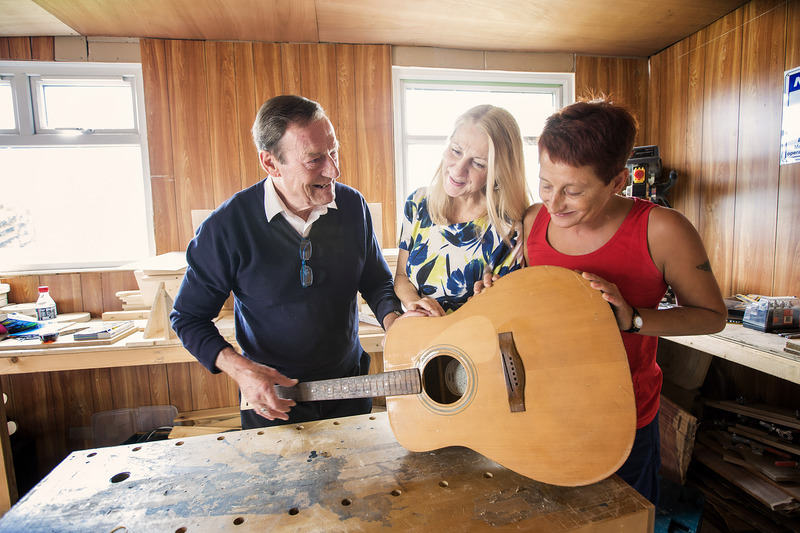 The Right Key in County Down, supported by National Lottery players, work with people recovering from addiction by giving them opportunities to explore their skills and interests. Through this work, people find meaning in each day of their recovery, helping them to stay hopeful for the future. Tony Donovan is one of the group’s members and credits the Right Key with giving him the strength to fight his addiction. Like many people working with the Right Key, Tony’s decline into addiction happened gradually. “It didn’t happen overnight but my addiction took over my life and I became a slave to drink,” says Tony. For years, Tony was able to hide his issues with drink. But after he lost his job as a pub manager in Dublin as a result of his addiction, his life began to spiral out of his control. It was this crisis that eventually led to Tony’s recovery. He entered a rehabilitation programme in Newry, determined to turn his life around. At the end of the programme, he got involved in the Right Key. In 2016, the Right Key started a new project that is using £159,409 of money raised by National Lottery players to teach people affected by addiction new skills. People taking part learn how to make guitars and other craft projects, and also create a Book of Recovery in which they tell their personal stories. The project brings affected people together to share their experiences, build up meaningful relationships with one another, and support each other through their recovery. Sheila Smyth, development officer at the Right Key, said the new project gives people meaning and hope for the future. “The people that we work with may be coping with addiction but they also have another side to them. Before their lives went into ashes, many of them would have had good hand skills like cabinet making and joinery, or had an artistic side. We talked to them about what they wanted to do and they told us that wanted to be active, and make things with their hands to feel content and worthwhile again. “Many people don’t make it through addiction but they will be remembered because some of their names will be carved into these guitars. We’ll capture deep moments of healing through the etchings, the secret artwork and names we’ll have inside the guitars. These guitars are going to be like the people who never made it to recovery still having a voice. When these instruments are played, they’ll still be part of our orchestra. They will still be remembered and have a voice within our concerts through these instruments. For people like Tony, the Right Key offers a bedrock of support. It gives its members the chance to rediscover who they were before their addiction took hold – and to discover who they can become through their recovery. The generosity of National Lottery players means that the Right Key are able to continue this important work and bring hope, light, and music to the lives of those affected by addiction.